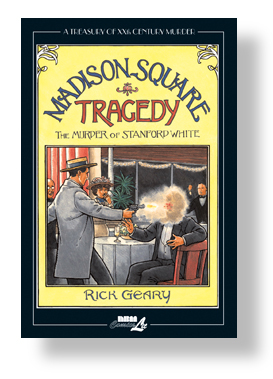 With over a dozen titles available in his Treasury of Murder series, it’s the latest, Madison Square Tragedy: The Murder of Stanford White that’s earned cartoonist Rick Geary a well deserved 2013 nomination for Best Graphic Novel for the 68th Annual NCS Reuben Awards. The Reuben Award is the highest honor that the profession bestows and is presented on behalf of the National Cartoonists Society. Rick Geary’s latest Treasury of XXth Century Murder volume, Madison Square Tragedy: The Murder of Stanford White is available now. Rick recently spoke to Comic Book Resources about what went into re-creating the Stanford White Murder, his distinctive style and the specific moment which sparked his interest in the genre. Read the interview HERE and after the jump read what critics are saying about Rick’s latest. Finally the whole story in a specially priced set, saving you $10!